Baxter here with a garden update for y’all. At least that’s what Julia says we’re making. It doesn’t look like any garden I’ve seen before. Two weekends ago, Julia lit the “garden” on fire. 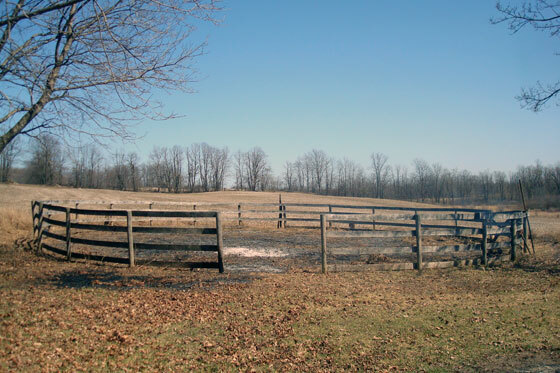 I used to love that spot of the field. The long grass was super, super sniffy. But now it’s gone. And I got to say, I didn’t love the fire. First, it was very, very big. I thought it was going to reach out and singe my furs. I’m a short-haired fellow. I don’t have many furs to spare. Second, I got all tangled up in the hose which was not very comfortable. And third, smoke makes me sneeze. I went into the garden to check it out last Saturday. It’s not as sniffy as it used to be. But it didn’t make me sneeze either. I rolled around a bit ’cause that’s what I used to like to do in the long grass. It felt different, but it was okay. Julia was not very happy after I rolled, and she decided to cover up all the ash. She and Matt got out the World’s Biggest Tarp. Matt probably should have stayed with her in the garden ’cause it took her a long time to get that tarp unfolded. I dunno what’s so difficult. She’s got thumbs! 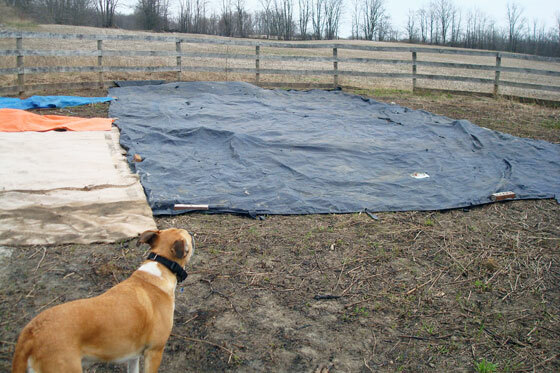 Even though she used the World’s Biggest Tarp, it still wasn’t big enough for the garden. Then she decided to use the big roll of carpet she found beside the garden. It wasn’t frozen anymore–I walked all over it and sniffed to make sure–but she still had a really hard time moving it. Julia vs. the carpet was more interesting than Julia vs. the tarp, but she didn’t make a video of that one. I was sunbathing, but I opened my eyes every so often to watch. I got up when she went to get Wiley. I keep an eye on that tractor. It took them a couple of tries, but they finally got the carpet into the front end loader. Then Wiley carried the carpet around the fence and dumped it in the garden. He’s pretty helpful even though he doesn’t have thumbs either. It still took Julia a long time to lay the carpet all out, but eventually it was spread out in the garden. Even though the carpet was wet and dirty and buggy and had plants growing in it, it was nicer to lay on than the pokey dry weeds. Julia wasn’t any happier when I laid on the carpet than she was when I rolled in the ash. After my afternoon walk with Matt, he took me from the front door right into the bathtub. That was not my favourite part of the weekend. Honestly, what’s the matter with a few smudges on my furs! The carpet and the World’s Biggest Tarp and two other little tarps still aren’t enough to cover the whole garden. Plus, some of them blew around in the wind, and we had to spread them out again the other day. I think we’re going to be working in the “garden” for awhile yet. Hopefully it starts to look like a garden soon. Maybe if there are some sweet potaters it’ll be okay.